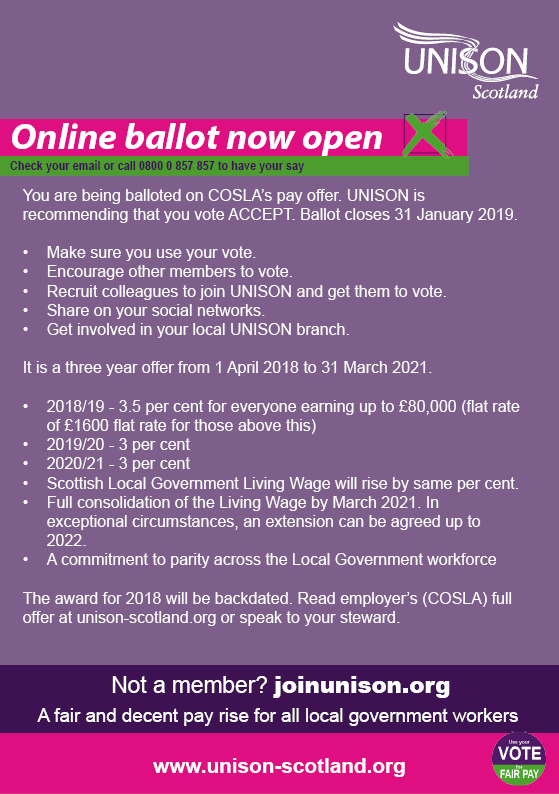 UNISON, the largest union in local government, welcomed the pay deal for local government workers agreed with COSLA on Friday 1 March. 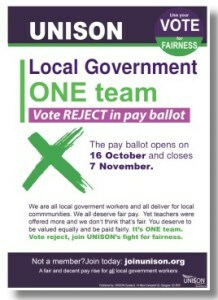 UNISON members had voted overwhelmingly to accept the offer in January and have been waiting on the outcome of the other local government trade unions to conclude their member consultations. Now that those other unions have concluded their ballots, and by majority vote of the trade union side at a meeting of the Scottish Joint Council today, the deal was agreed. COSLA will now write to all councils asking them to process payments. They anticipate that most will be able to implement in March salaries. COSLA have today, Wednesday 19 December 2018, tabled an improved pay offer for local government workers, a move which has been welcomed by the trade union UNISON. UNISON have welcomed the move and its local government committee agreed this morning to ballot their members in the new year, urging them to accept the offer. postcard to CoSLA (Convention of Scottish Local Authorities) demanding fair pay for all who work in local government. This builds upon the postcards delivered to John Swinney from our members working in Education calling for parity in the pay award with the teachers. 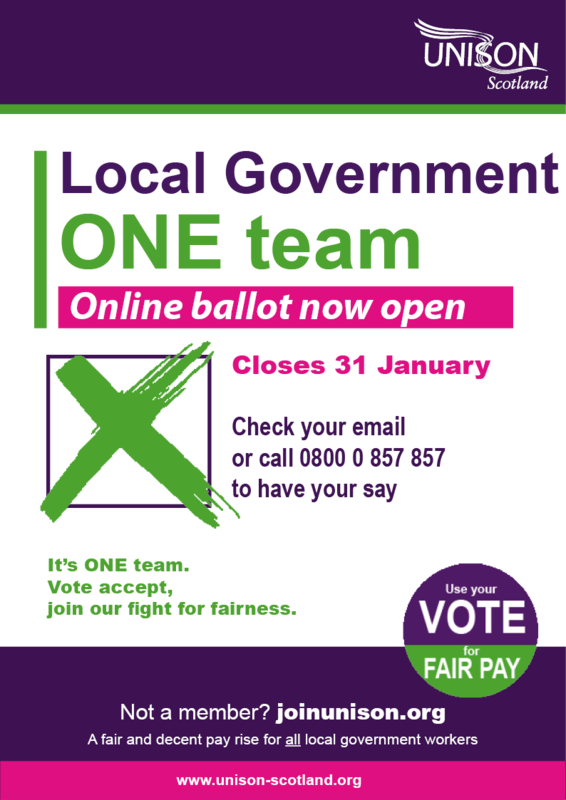 The new postcard campaign, Local Government , One Team. 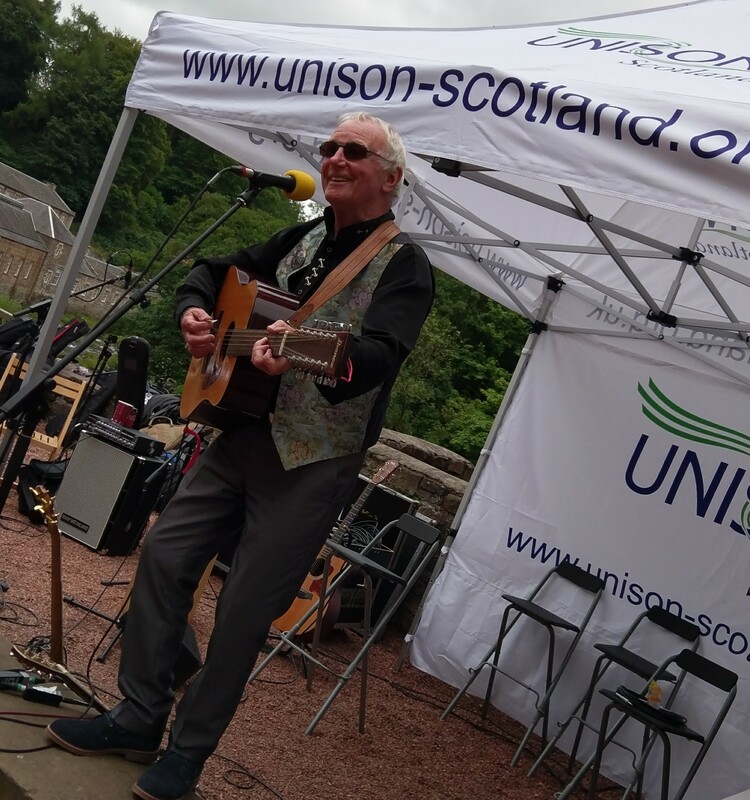 delivering for our local communities, will take the demand for fair pay to CoSLA in advance of the next meeting of Council Leaders on 31 August, so they will be more than aware of the strength of feeling among UNISON members. The unions have smashed the public sector pay cap with the current offer for local government employees, at 3% for those earning £36,500 or less, 2% for those earning between £36,500 and £80,000, and a £1600 flat rate for those earning above (all based on a 37 hour week), but it still is not nearly enough to make up for the years of under inflation pay rises. Moreover, there should be no reason that other sectors of local government deserve a greater pay award. Whilst COSLA have been consistent in their agreement with the unions about the need to uphold the principle of parity across the local government bargaining groups, UNISON needs your backing to give them the power to their elbow in their discussions with the Scottish Government and to remind them that we will not give up on this. So get your postcards from your stewards, and get them filled in and sent off or back to the branch. Don’t miss a fantastic free family fun day at New Lanark World Heritage site on Sunday 19 August. All members, their families and friends welcome. 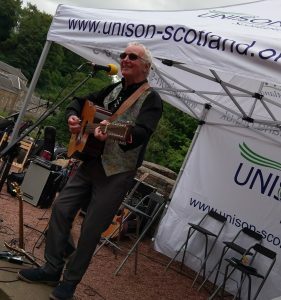 There’s music from Scottish folk singer Alastair McDonald, ukulele and guitar duo Palmeros, the Carmunnock Covers, the Easkilbusbies, and some light original jazz from Mhairi. Plenty to do for the kids too with a bouncy castle, balloon modelling, face painting and story telling and the Universal Connections Bus just in case they can’t keep away from technology, with access to tablets and 3D movies. Free buses from EK, Hamilton and Glasgow Contact the South Lanarkshire UNISON Branch Office on 01698 454225/4690 to book your places. UNISON is challenging all political parties and interest groups to work together to develop a national strategy to address homelessness, a strategy that will look at the causes, the health perspective and the impact of welfare reforms. The strategy needs to look at housing solutions, including the building of council and other social housing, affordable for the homeless and low income households. The union will also continue to campaign for the end to welfare cuts and income austerity, to highlight the plight of homeless people and to call for an end to rough sleeping. Kate Ramsden, moved the NEC amendment, highlighting the new Homelessness Reduction Act 2017 – a key policy development in tackling homelessness in England that came into force in April this year and is modelled on a similar law introduced in Wales three years ago, placing a duty on councils to help prevent homelessness of single people and families. She illustrated the problem with some statistics from a recent report by Crisis and Joseph Rowntree Foundation – there has been a 169% rise in rough sleeping, a 48% rise in the number of homelessness cases dealt with by local councils and a staggering 250% rise in people living in bed and breakfast accommodation since 2010. Caroline McLean, Edinburgh City, supporting the motion, and a Housing Officer working in Homelessness Services for the authority, “The service provides a one stop shop for complex needs clients such as housing, social work, GP practice, community psychiatric nurses, welfare benefits and so on. She pointed out that it’s often hard to find accommodation – they run out of accommodation or a supported unit refuses because their needs are too high, or a B&B refuses because of the way they look or they have been problematic in another B&B, and of course B&B staff are not trained to deal with homeless people. Then on the other hand, the homeless person may refuse accommodation, Caroline explained, they have stated it’s often safer to sleep on the streets, and if they do take accommodation they don’t like to complain as they could be asked to leave. UNISON has pledged to continue its support for workers’ rights in Turkey through initiatives from the European Federation of Public Service Union (EPSU) and Public Service International (PSI). This will include putting pressure the UK Government to prioritise human rights and democracy in its negotiations with Turkey – calling for fair hearings and re-instatement for public service workers arbitrarily dismissed, an end to the repression of the Kurdish people, the lifting of media outlet closures and release of jailed journalists, and the release of political prisoners and to resume the peace process. The union will also urge the UK government along with the EU member states to support the resettlement of refugees from Turkey rather than returning refugees and asylum seekers to Turkey on the flawed basis it is a safe third country. “That’s what has happened to thousands in Turkey, where the government used terror laws to clamp down on legitimate activities such as trade unionism and journalism and jail trade unionists, journalists, members of women’s groups and public sector workers. They removed the right to work from thousands more and if your bank account was held in certain banks your funds would be frozen and you could also be jailed for banking at that particular bank. Margaret told us that the South Lanarkshire Branch runs a solidarity campaign sending postcards to female prisoners in Turkish jails and urged other branches to build links with prisoners, trade unions and women’s groups in Turkey and pointed out that they had managed to persuade some of our Scottish politicians to pair themselves with jailed politicians in Turkey and show solidarity at trials. UNISON will take its campaign to save and support library and cultural services to our politicians, our members and our communities, highlighting the importance of these services to our communities. The campaign will look for branches to lobby their politicians, encourage their members and their communities to use the libraries and other cultural services such as museums and public parks, and to get their councils to sign up to a new cultural charter.